Eid away from your family or country can be difficult sometimes. The customs are different or perhaps you can’t find anyone to celebrate with, and all the joy in the holiday seems hard to capture. But you’re in luck if you’re spending it in Riyadh! There’s loads of ways to make it more festive here, all you have to do is plan it properly. Here’s six easy ways to help you get on the right track! Put up banners, hang lanterns, and stick fairy lights everywhere! It’s amazing how much a few sparkly lights can make a place look happier. Arabic style lanterns are gorgeous and easily found anywhere, from the SR 2 shops (that don’t actually sell anything for SR 2, but still manage to be an emporium of all sorts of odds) to IKEA. And mostly anything can be printed off the Internet. 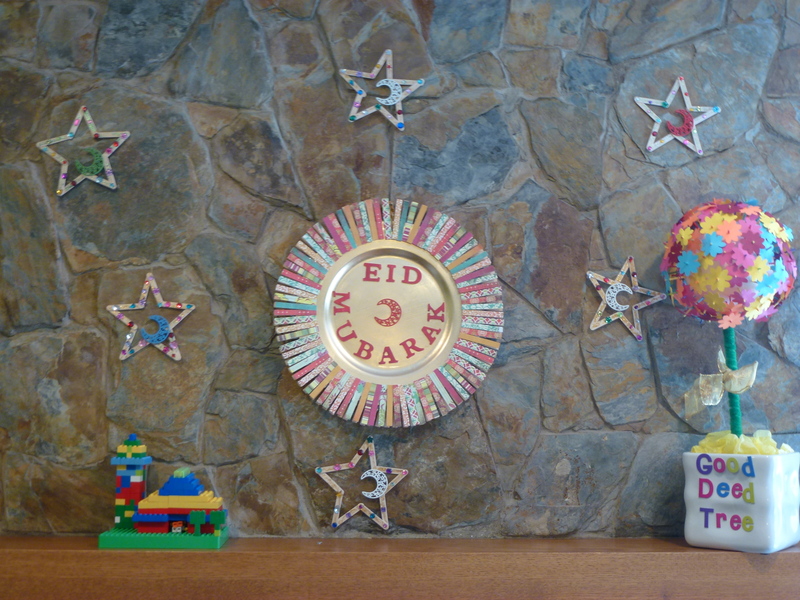 Just Google “free Eid printables” and a number of helpful results will pop up! Eid prayer is a “fardh kifayah,” meaning that as long as there are people attending it, it is not obligatory for the rest. Which means that a number of people usually skip it, especially since they’re used to living on a Ramadan schedule and leaving the house at Fajr prayer is exhausting. But for me, Eid prayer basically constitutes all that is beautiful about Eid. There’s a sense of community as you show up at the masjid, and see your neighbors and their prettily dressed up children wishing each other well and passing out sweets. So pick up a box of candy and go to your nearest masjid! I’ll guarantee it’ll make your Eid better. The best thing about Riyadh is that the city’s Amanah (municipality) always brings out the big stops every year. Traditional dances, plays, and fireworks are held for all three days of Eid and copies of the schedule are normally handed out with local newspapers. My personal favorite is the traditional dance show that showcases all the dances from each of the thirteen regions. 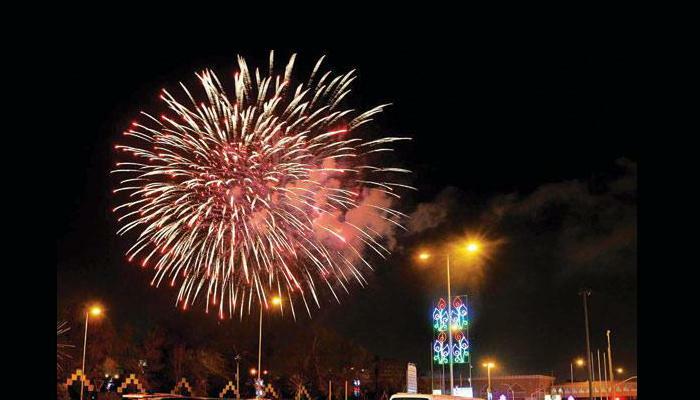 It’s held at the old part of Riyadh (Diriyah) on the first evening of Eid and normally spans an hour or two. The energy of the show is brilliant, and although it’s broadcasted live on Saudi 1 every year, attending the live performance would be a more fun experience. This is something my parents used to do when we were abroad. Every Eid not spent in Saudi Arabia, they’d hold a large evening dinner at our house and invite all our close friends who were in a similar situation (i.e. without family). It made it much better, as celebrating Eid is centered on doing so with family, and celebrating with friends we loved was a very good shoe-in for our families back home. The lure to spend the days in sweatpants is strong after the speeding train that is Ramadan, I understand. But sometimes just the mere act of putting on your best clothes can change the general atmosphere from Average Day into something festive. Your sweatpants tells your brain it’s just another day, while your shamagh or suit or dress and heels jumpstarts it into thinking it’s a special day. Even if you just dress up and visit your local fast food chain, it’ll make it more exciting for you (and your kids if you have any). Eidiyat, small amounts of money given to children on Eid day, is a widespread Muslim tradition. But when you’re abroad, there’s generally no one to give to (or receive from) money, and it takes away a little joy from the holiday. So why not send out gifts instead? Find inexpensive thoughtful items to send to coworkers, your neighbors, your family, any help that you might have, even the landlord if you have one. It doesn’t have to be all of them either, just choose the people you’d like to make happy by showing them you remembered them this Eid. You could even use your Ramadan mornings more effectively and DIY a couple of gifts! Just keep in mind, it’s the thought that counts, really. And that’s it! We hope you have a great Eid. Drop us a line @DestinationRyd if you have better ideas or experience on how to make Eid more festive, and let us know if you tried any of the above!